In social sciences the need often arises to compare and rank groups of respondents by analyzing huge amounts of data and composite indicators are amongst the most effective tools. The paper aims to design an original procedure suitable for ordinal data and able to synthesize subjective evaluations while accounting for both agreement and heterogeneity in response patterns. A composite indicator for ordinal data based on cub models is introduced: the proposal discloses and preserves the heterogeneity also at an aggregated level. Empirical evidence relies on perceived discrimination analysis stemming from the Special Eurobarometer Survey 2015. This research has been partially funded by the CUBREMOT project (code: RBFR12SHVV) of the University of Naples Federico II, Italy. Authors thank very much Editor and Anonymous Referees for their critical comments and suggestions. European Commission. (2007). Tackling multiple discrimination: Practices, policies and laws. Directorate general for employment, social affairs and equal opportunities, Unit g.4. http://ec.europa.eu. E.U. Agency for Fundamental Rights. (2011). Handbook on European non-discrimination law, European Court of Human Rights. http://fra.europa.eu. Fattore, M., & Maggino, F. (2017). Some considerations on well-being evaluation procedures, taking the cue from .“Exploring multidimensional well-being Switzerland: Comparing three synthesizing approaches”. Social Indicators Research. https://doi.org/10.1007/s11205-017-1634-0. Iannario, M., Piccolo, D., & Simone, R. (2017). CUB: A class of mixture models for ordinal data. R package version 1.1.1. http://CRAN.R-project.org/package=CUB. Punzo, G., Castellano, R., & Buonocore, M. (2017). Job satisfaction in the “Big Four” of Europe: Reasoning between feeling and uncertainty through CUB models. 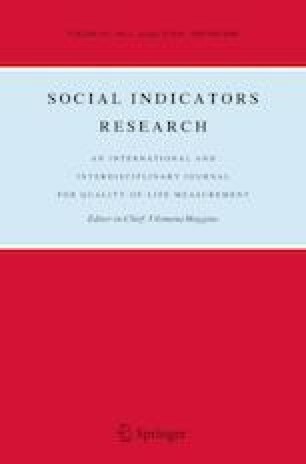 Social Indicators Research. https://doi.org/10.1007/s11205-017-1715-0.